That’s right. I said easy lasagna-stuffed chicken! Bam. Tip: You can replace a boneless skinless chicken breast for the chicken. The Mr. Bar-B-Q Ultimate Burger Basket is the most amazing, quality burger basket I’ve ever used (and I’ve used a few. I’ve been around that block). Pressing meat perfectly in place (see images below), the basket secures easily to ensure even pressure across four patties, chicken breasts, or anything else you might want to press flat during grilling. You could even grill vegetables, fish or hamburgers in here and know they’ll still be there when you come back (I sob when I lose food between the grill grates). I also love that the solid-quality wooden handle stays cool to the touch for safe grilling. I was so jazzed about this product, I had to try stuffing some chicken, which begged the question, Would it hold the fillings in the chicken without those wretched toothpicks? The answer is yes! Below is a close up of how nicely the chicken is held in place. I didn’t have the mess or have to deal with broken toothpicks because this basket holds everything perfectly. This burger basket keeps chicken snug and juicy. 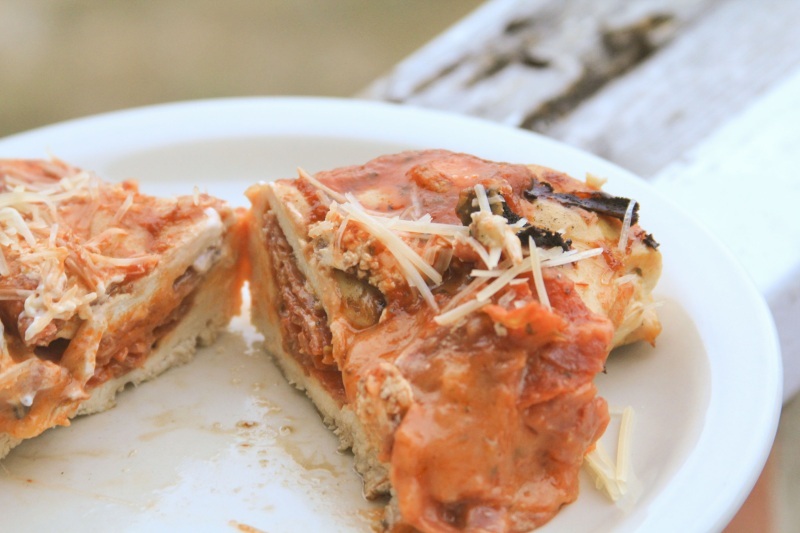 For this delicious casserole-in-a-chicken breast, I decided to use the pizza sauce only as an afterthought in this dish since tomato/acids have never really served me well in the chicken cooking process. I find that creamy, decadent dairy-based beauties like ricotta and mozzarella net the best fillings. And what’s more, mixing all the fillings in a bowl makes it easy to prepare. Tip: Brining chicken before cooking helps keep moisture inside. This recipe is easy to make ahead and reheated for quick lunches or dinners, and for only 334 calories and 2.7 net carbs, you can indulge a little knowing that this filling, cheesy dish will please even the pickier palates around the dinner table. Tip: You can use frozen spinach in place of fresh if you decrease the amount by about half and drain thoroughly. And, by the way, even though I had to try out this basket for chicken, I guess you could use Mr. Bar-B-Q’s Deluxe Burger Basket for making hamburgers, too. I guess. Rinse the chicken. Pat dry. Remove membranes from the chicken. Carefully cut a slit in the top of the chicken to form a pocket the length of the chicken breast. Brine chicken in 1 tsp pepper, 2 Tbsp olive oil and 1-1/2 Tbsp lemon juice for an hour. Drain off brine. If using oven, preheat to 325 degrees Fahrenheit. If using a grill, begin heating. Toss cheeses, pepperoni, seasoning, salami, spinach and onion together in a medium mixing bowl. Stuff chicken. Grill chicken for 12 minutes per side, or bake uncovered in a 325 degree Fahrenheit oven for 45 minutes (or until chicken is no longer pink). To plate: top hot chicken with a schmear of pizza sauce and sprinkle with Parmesan cheese. Makes 3 large chicken breasts, or 6 servings. 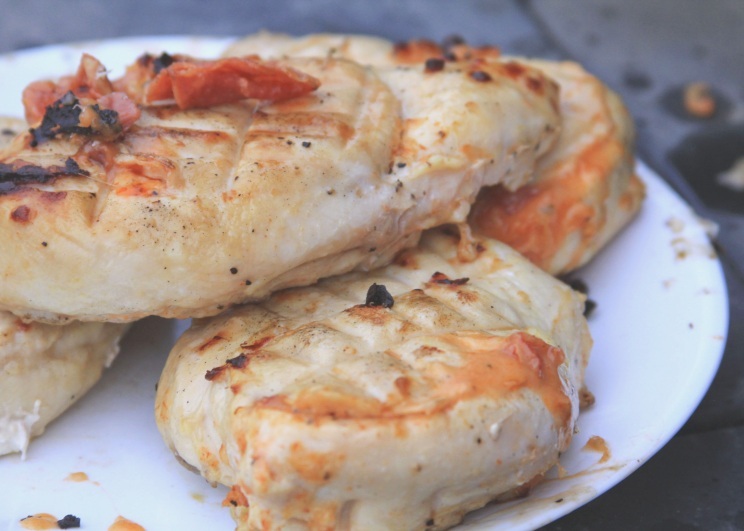 Delicious, simple chicken is positively easy and less messy. A plate of grilled chicken, moist and perfect. Hey, it doesn’t matter that we’ll have snow next month; we grill all year-long in Colorado. Just look for those pink moon boots and let’s do it. 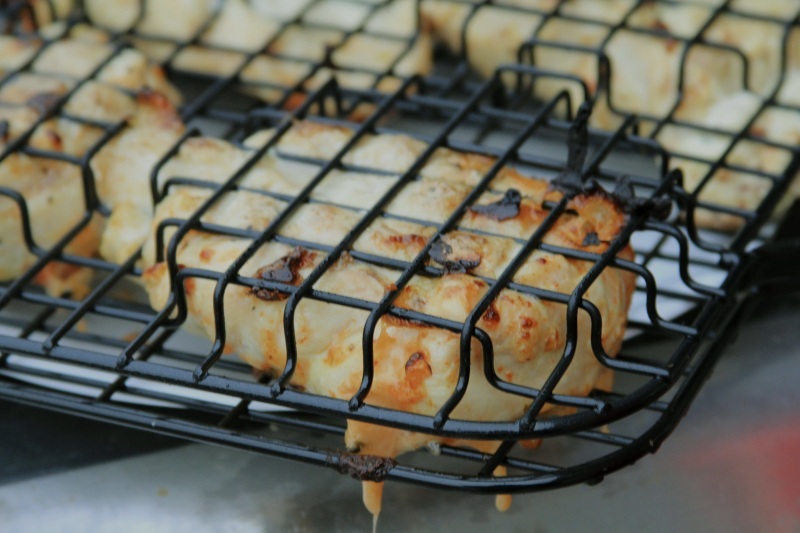 Usefulness: On the grill for cooking meats, vegetables or anything else you want to tame. Disclosure: Mr. Bar-B-Q provided this product free of charge for review, but this has not affected my review of the item. Amazing! I have to make this next time boneless chicken is on sale! This sounds so good! 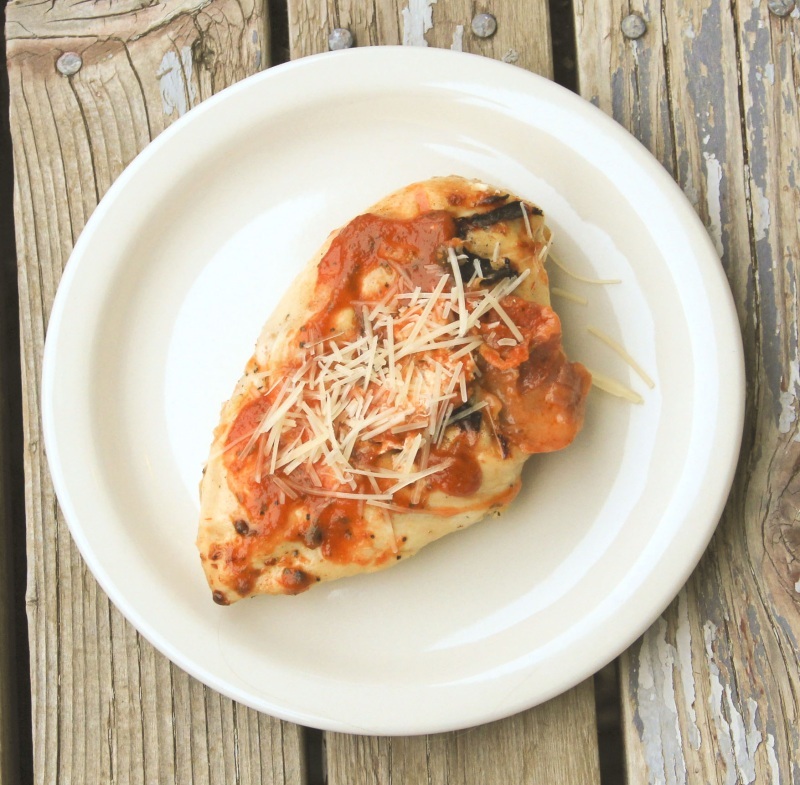 Pizza stuffed chicken look delicious! What do you mean by “Brining chicken before cooking helps keep moisture inside.” What is brining? Brining is soaking it in the oil/lemon juice to both slightly tenderize and moisten prior to cooking–especially on the grill. YUM!!! That looks sooo good! I hope you try it! we really love it. What brand of no-sugar pizza sauce do you like? I buy the store brands of pizza sauce. They typically do not contain added sugars, but check the labels just to be sure. Oh, yeah! Definitely a keeper. Technically, whAt you are describing is called marinating. Brining is actually soaking the meat in a salt water (some brining recipes will use sugar in the solution as well). Can’t wait to try this!!!!! Yum! What’s the best alternative to ricotta for this recipe? I cannot stand ricotta cheese. Hi, Joshua! I saw your post elsewhere, but you ask such a good question, I’ll answer it here, too. Instead of ricotta, cottage cheese mixed with Parmesan (grated) is an excellent replacement. Hi Jamie. Could you use frozen spinach instead of fresh? Just wondering. It looks very good..will definitely make it.. ooops..I just saw the response about using half when using frozen spinach..sorry..silly me..
Hi, Deanna! I’m glad you asked. Absolutely you can. Just be sure to remove as much moisture as possible. When you say, “Carefully cut a slit in the top of the chicken to form a pocket the length of the chicken breast,” what do you mean by “the top”? I’m picturing the breast lying flat, so the cut would be across the top of the flat surface … but it sounds more logical to cut it in the side. I can’t really tell from the pictures. What I did (it was impossible to photograph the process with chicken crud all over my hands– I wanted to, though) was to start the cut on the top edge, so you have like a sleeping bag type slit across the front top but on the top surface–not from the side (this keeps toppings from oozing out the side). Then you carefully ease a sharp knife back and forth to cut a pocket that ends up being in the center cavity of the chicken. I carefully place my hand on top to steady the breast and make sure to keep the knife inside of the chicken. I learned this method from a Gordon Ramsay show. Yay for reality tv! This recipe is AMAZING! Possibly the best thing I have ever eaten! THANK YOU!! !